On February 10, 1987, an ambulance arrived at an outpatient surgical facility to care for an unresponsive patient. The woman had begun having asthma symptoms after her surgery. Staff had twice helped her to use her inhaler, but then she'd stopped breathing. The ambulance crew found the patient, 22-year-old Elise Kalat, lying on the floor. One nurse was performing CPR by pressing on Elise's abdomen rather than her sternum and another nurse was only managing to inflate Elise's cheeks, not her lungs, with the ambu-bag. The doctor at the facility was under the impression that the CPR was effective because he was checking for a pulse in the wrong place. Nobody had initiated professional level resuscitation procedures such as intubating the patient, defibrillating her, monitoring her cardiac signs on EKG, or administering cardiac medications. Medics took over Elsie's care. She was finally successfully resuscitated at the hospital, but due to improperly performed CPR she had suffered devastating brain injury. Her condition continued to deteriorate and she died on February 12. 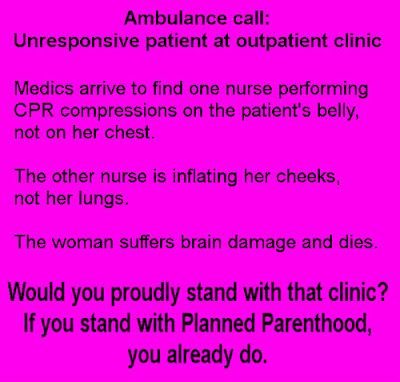 The outpatient surgical facility was a Planned Parenthood in Massachusetts. 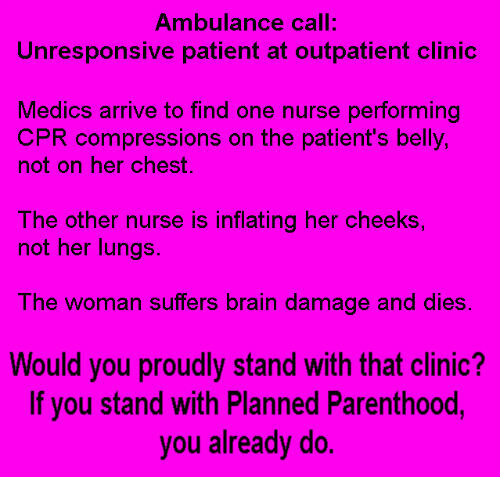 You don't have to oppose abortion to recognize -- and be appalled by -- incompetence that costs a young woman her life.